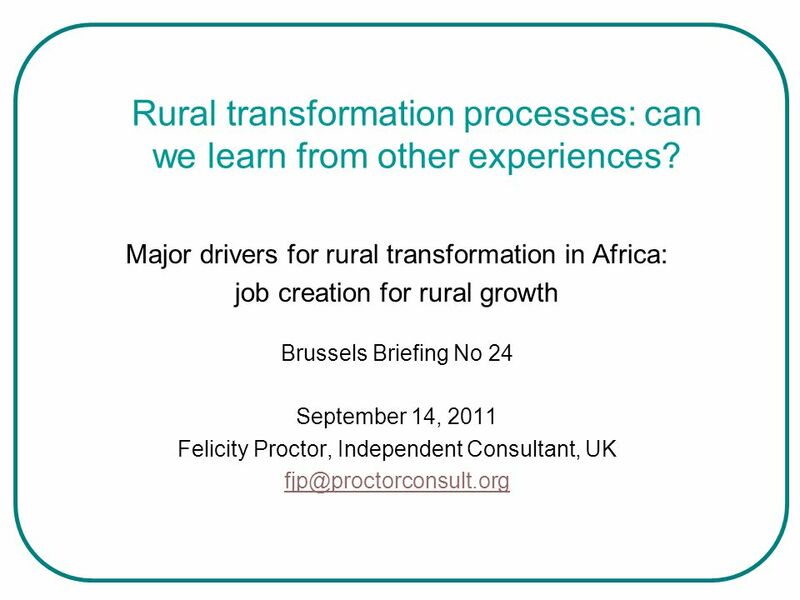 Rural transformation processes: can we learn from other experiences? 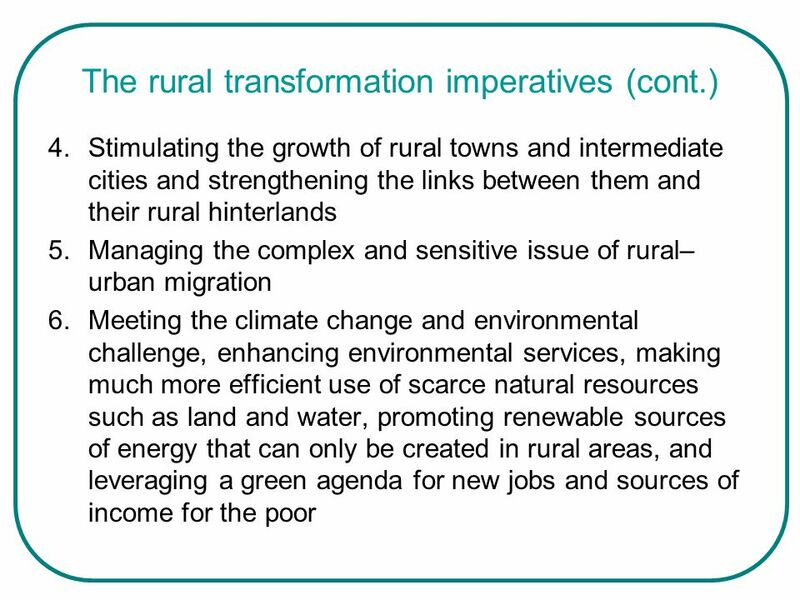 1 Rural transformation processes: can we learn from other experiences? 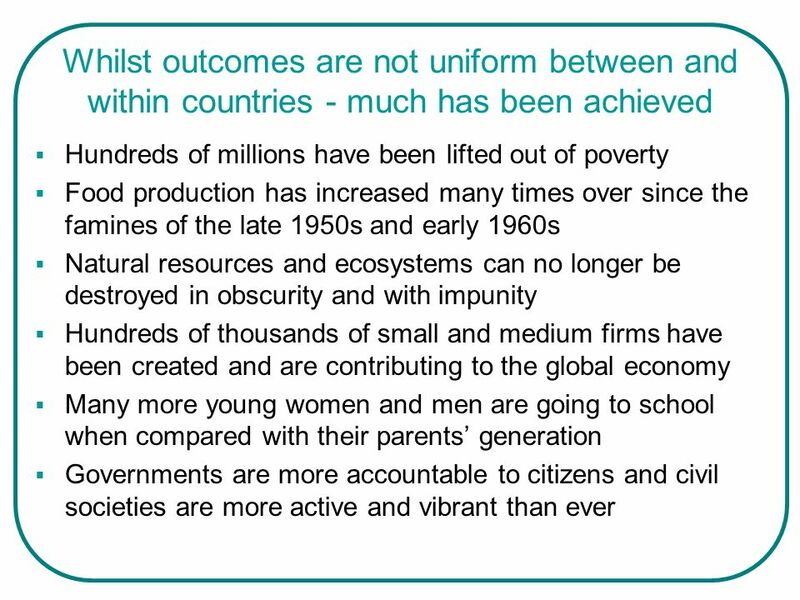 Hundreds of millions have been lifted out of poverty Food production has increased many times over since the famines of the late 1950s and early 1960s Natural resources and ecosystems can no longer be destroyed in obscurity and with impunity Hundreds of thousands of small and medium firms have been created and are contributing to the global economy Many more young women and men are going to school when compared with their parents’ generation Governments are more accountable to citizens and civil societies are more active and vibrant than ever What the rural societies of the emerging countries have done in the last generation is an achievement that has not been registered by any other nation in a similar period of time or on such a scale. 6 Four countries – Four approaches? Brazil - Total pop.193.7m 16% rural China - Total pop 1.33b rural 53.4% Strengthening family farms and increase numbers, increasing minimum wage and securing social inclusion of the rural poor Zero Hunger Programme Then National Programme for the Strengthening of Family Farming (PRONAF) and the Marketing Food Acquisition Programme (PAA) Territories of Citizenship Programme-budget US$15.3 b (2010): new approach to secure productive inclusion of poor people, universal access to basic programmes, expansion of social participation and increase efficiency of public policies. 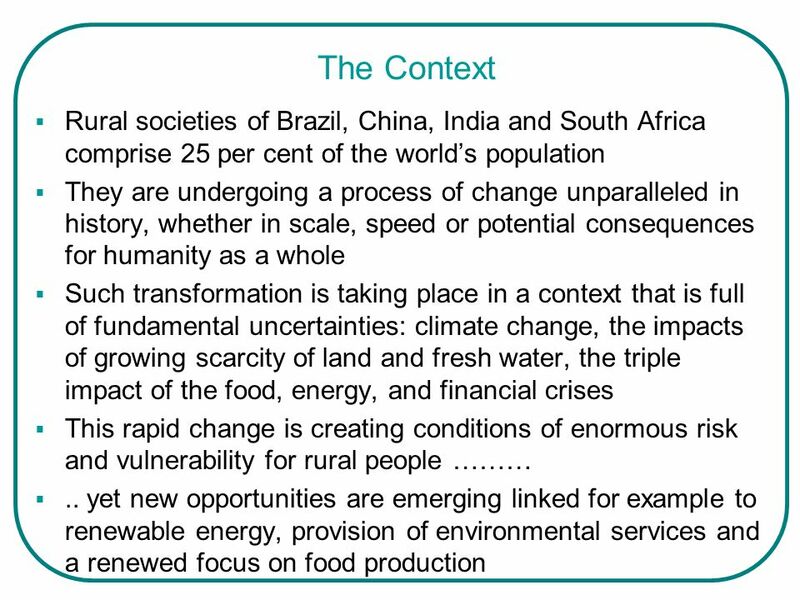 Dual agricultural system still remains Rural Pop to decrease to 30–35% in next 20 years. 220 million farmer-HH operate on less than 0.6 ha per HH. Township and Village Enterprises -TVEs ( ) provided 119 million jobs. 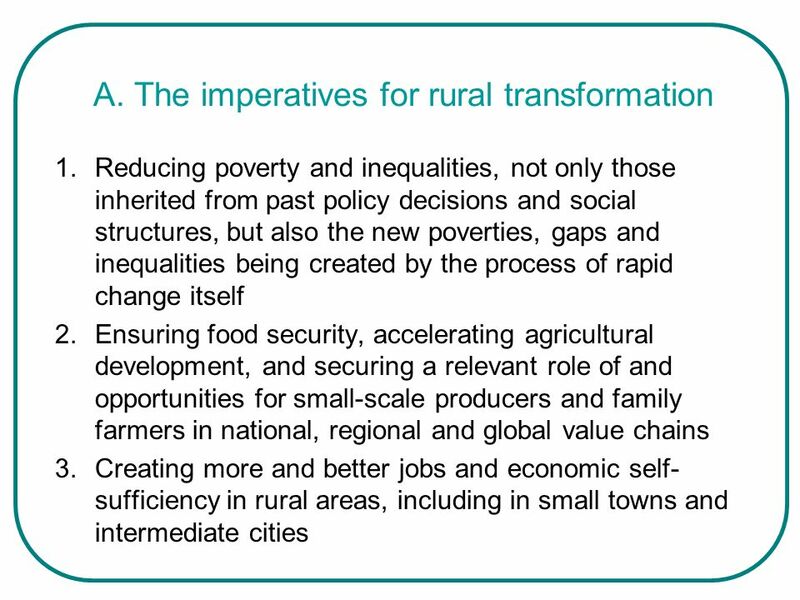 Rural social safety nets have been established Current focus: ensure national food security relying on domestic production to guarantee food supply and basic self-support of key foods; renewed focus on agriculture incl. 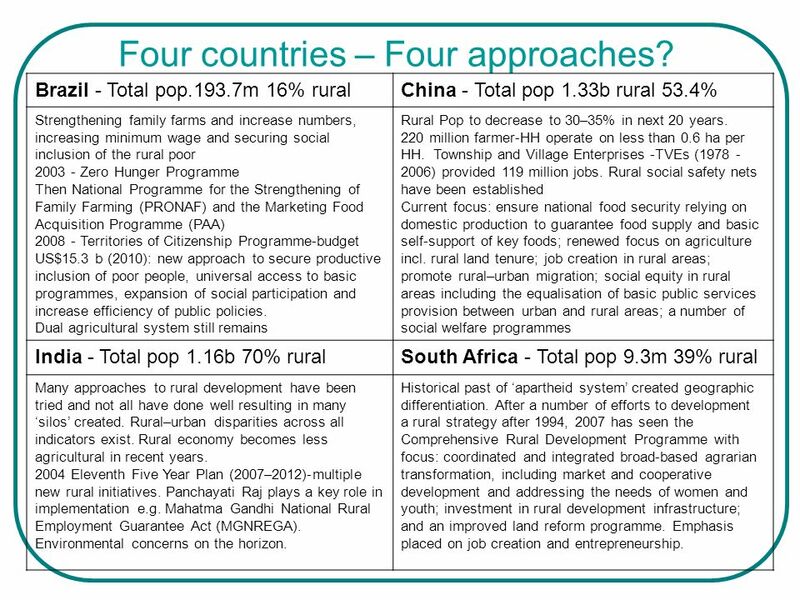 rural land tenure; job creation in rural areas; promote rural–urban migration; social equity in rural areas including the equalisation of basic public services provision between urban and rural areas; a number of social welfare programmes India - Total pop 1.16b 70% rural South Africa - Total pop 9.3m 39% rural Many approaches to rural development have been tried and not all have done well resulting in many ‘silos’ created. 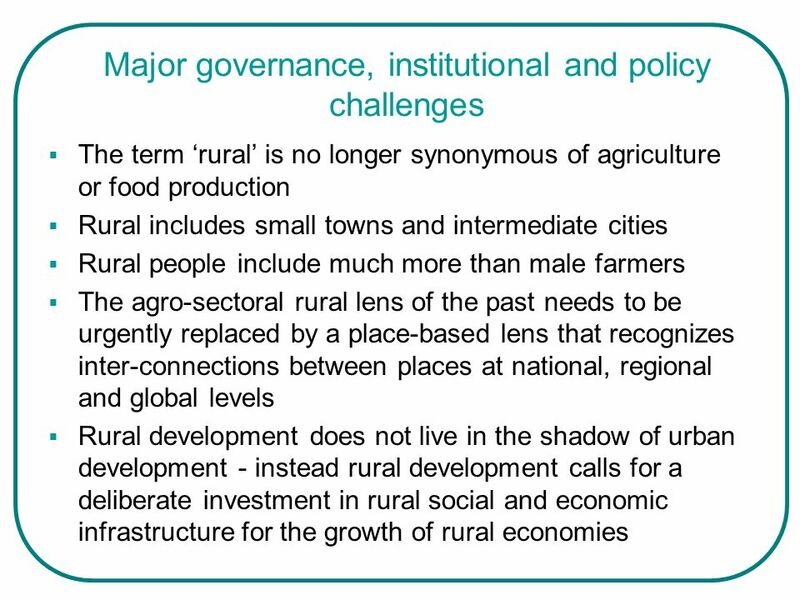 Rural–urban disparities across all indicators exist. Rural economy becomes less agricultural in recent years. 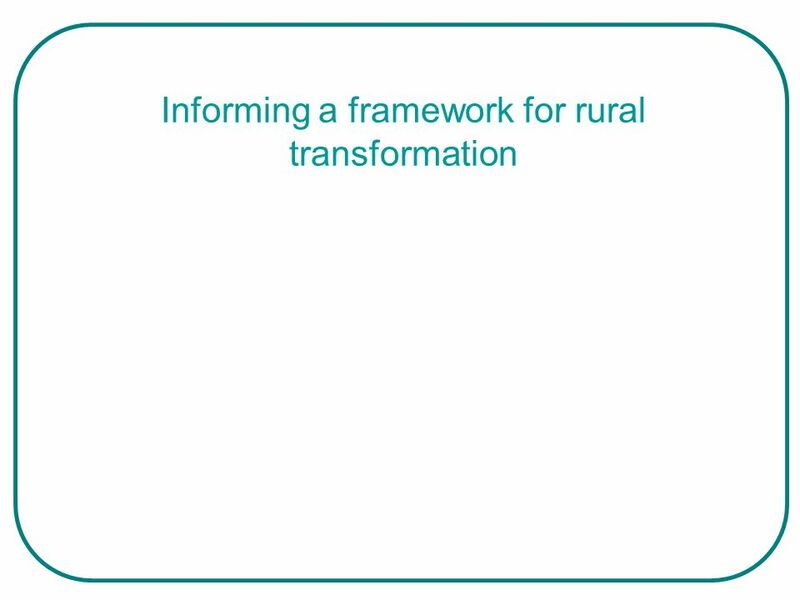 2004 Eleventh Five Year Plan (2007–2012)-multiple new rural initiatives. 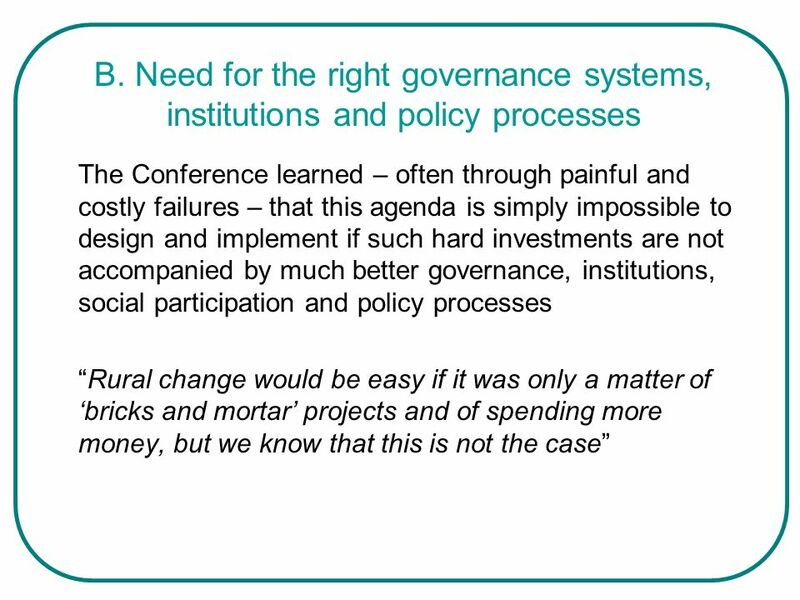 Panchayati Raj plays a key role in implementation e.g. Mahatma Gandhi National Rural Employment Guarantee Act (MGNREGA). Environmental concerns on the horizon. Historical past of ‘apartheid system’ created geographic differentiation. 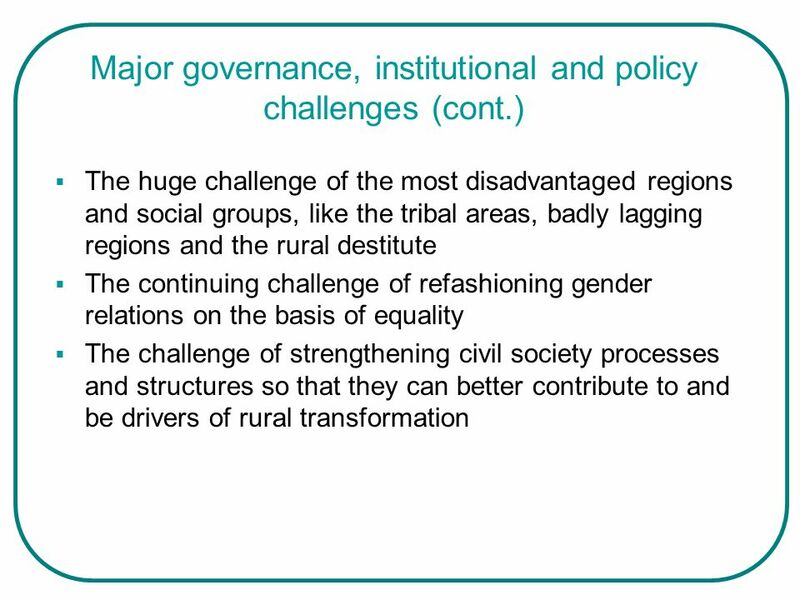 After a number of efforts to development a rural strategy after 1994, 2007 has seen the Comprehensive Rural Development Programme with focus: coordinated and integrated broad-based agrarian transformation, including market and cooperative development and addressing the needs of women and youth; investment in rural development infrastructure; and an improved land reform programme. Emphasis placed on job creation and entrepreneurship. 7. 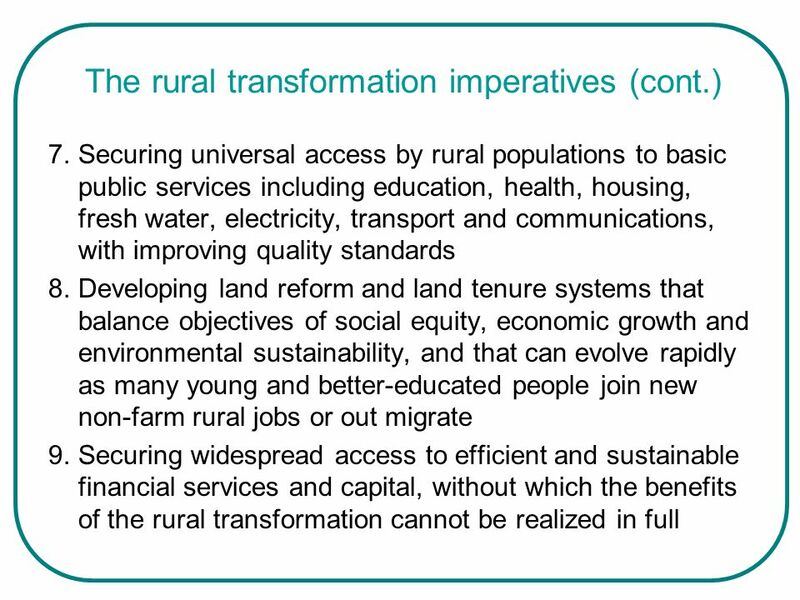 Securing universal access by rural populations to basic public services including education, health, housing, fresh water, electricity, transport and communications, with improving quality standards 8. 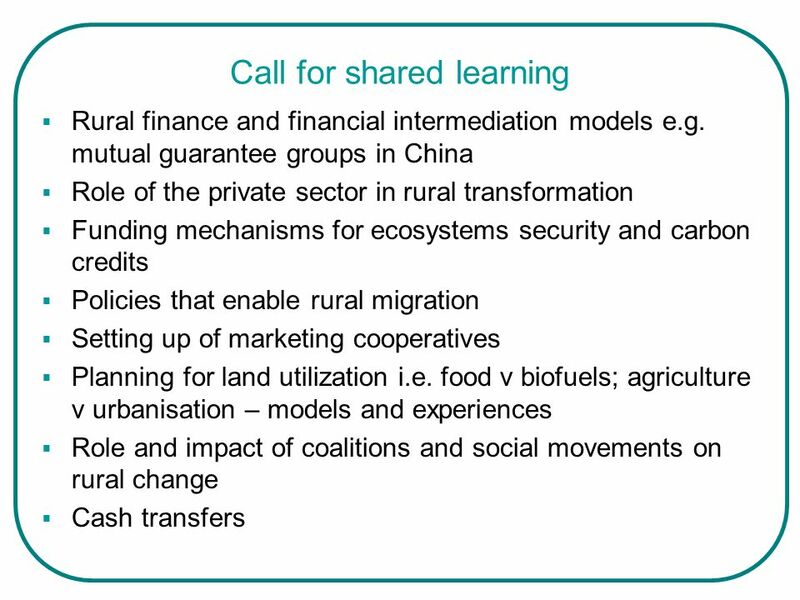 Developing land reform and land tenure systems that balance objectives of social equity, economic growth and environmental sustainability, and that can evolve rapidly as many young and better-educated people join new non-farm rural jobs or out migrate 9. 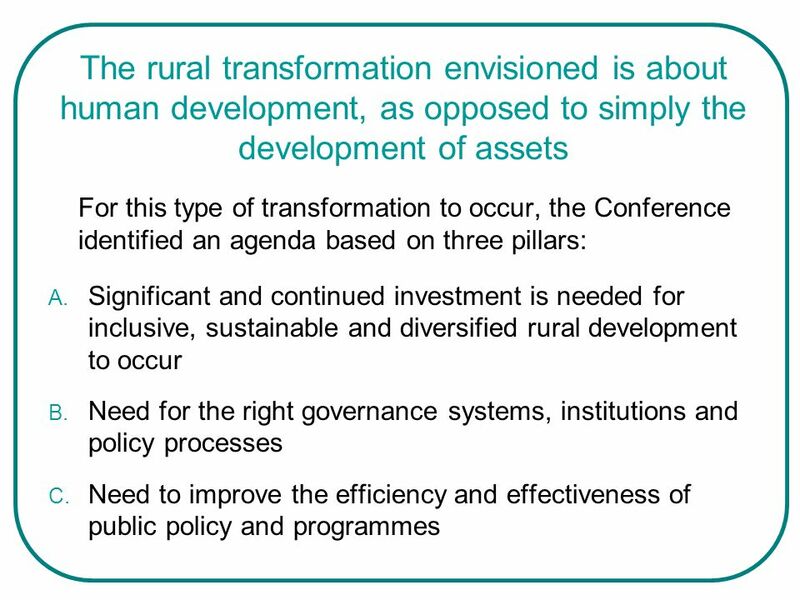 Securing widespread access to efficient and sustainable financial services and capital, without which the benefits of the rural transformation cannot be realized in full Point 9 - This requires a significant expansion of financial resources and budgets, as well as major improvements in the efficiency and institutional sustainability of rural financial systems. 10. 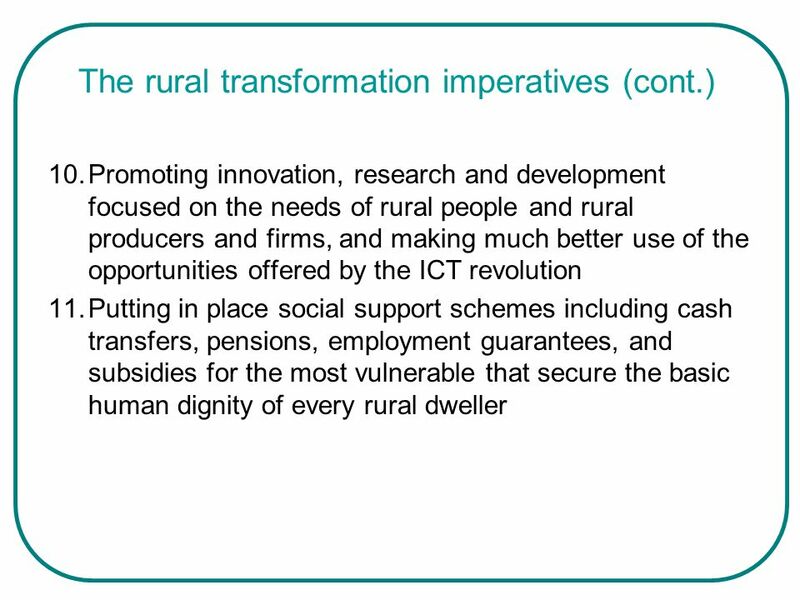 Promoting innovation, research and development focused on the needs of rural people and rural producers and firms, and making much better use of the opportunities offered by the ICT revolution 11. Putting in place social support schemes including cash transfers, pensions, employment guarantees, and subsidies for the most vulnerable that secure the basic human dignity of every rural dweller Ref Point 11 At the same time, it is important to reaffirm that poverty eradication and social inclusion will lead to better long-term outcomes and be more sustainable if they rest on localized, inclusive economic growth, complemented and not replaced by social support schemes. 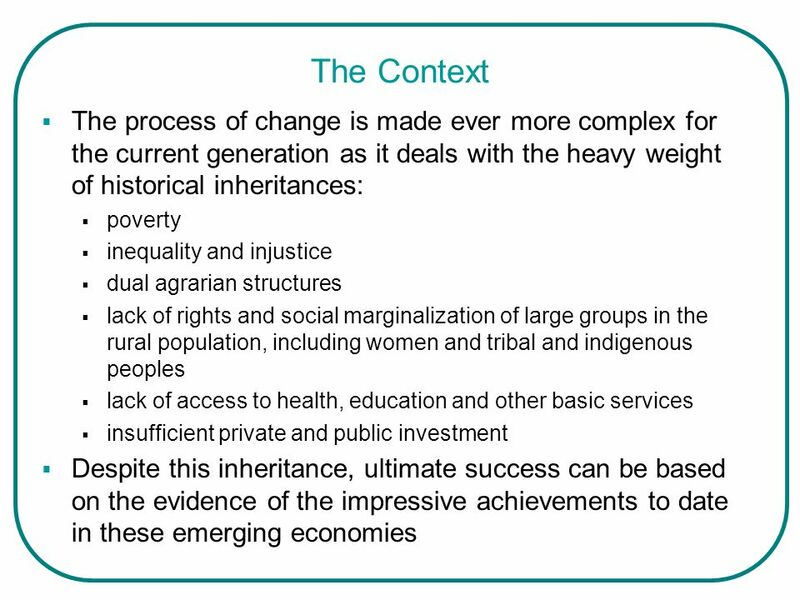 Why development investment outlays are not having the desired outcomes? 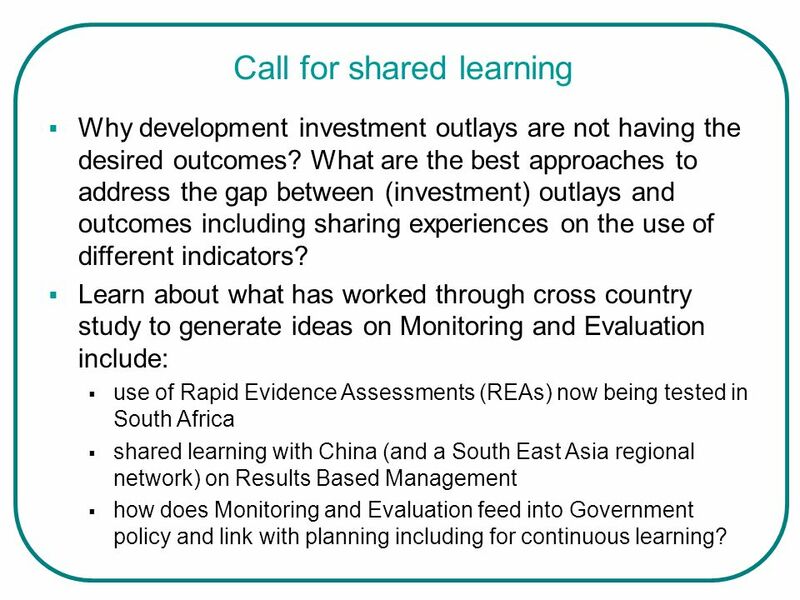 What are the best approaches to address the gap between (investment) outlays and outcomes including sharing experiences on the use of different indicators? 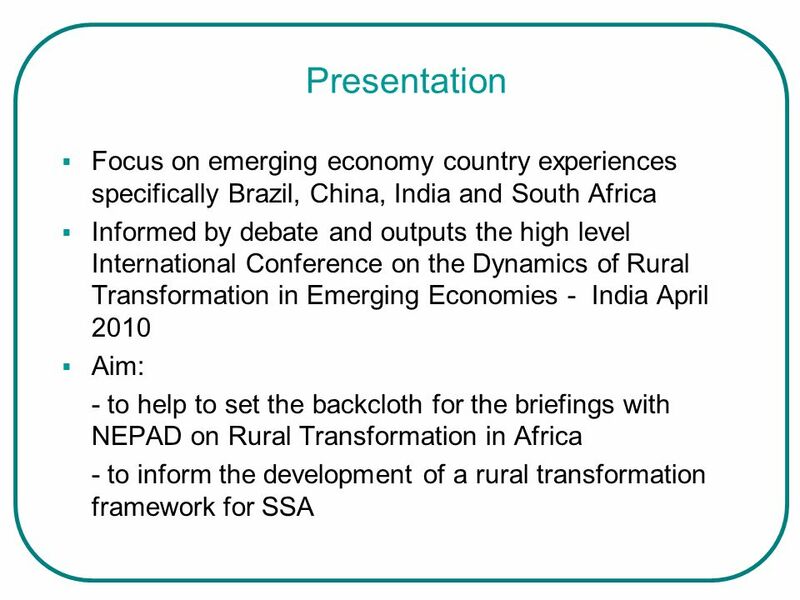 Learn about what has worked through cross country study to generate ideas on Monitoring and Evaluation include: use of Rapid Evidence Assessments (REAs) now being tested in South Africa shared learning with China (and a South East Asia regional network) on Results Based Management how does Monitoring and Evaluation feed into Government policy and link with planning including for continuous learning? 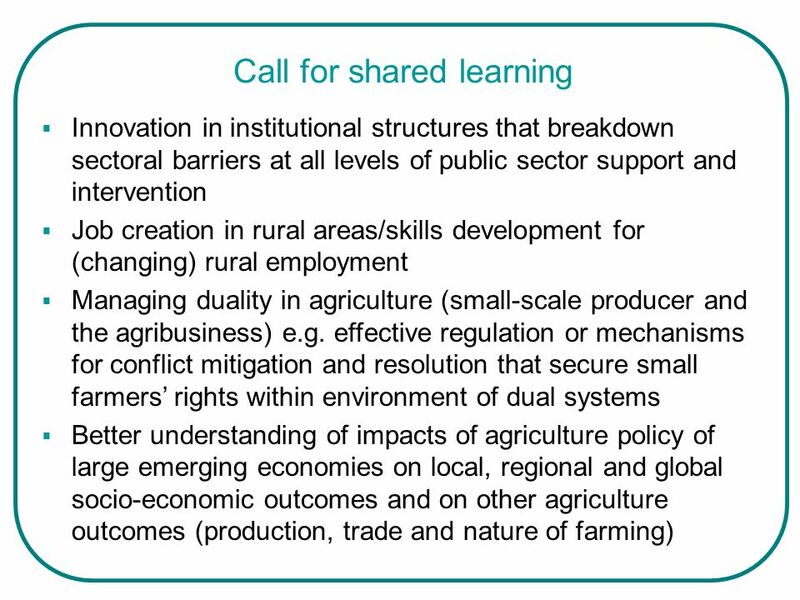 It was noted that any development practice lesson learning or sharing needed to be underpinned by a common understanding of the different measures/indicators and contexts. 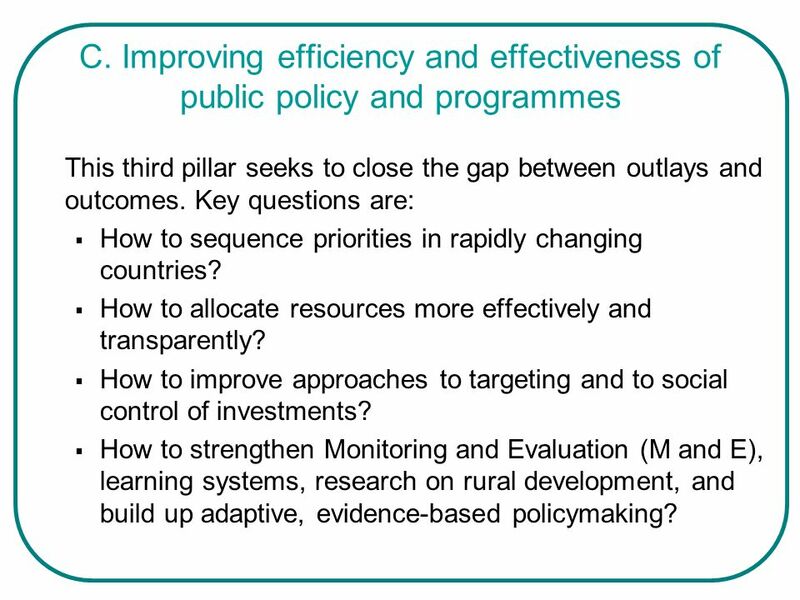 There is need to improve the capacity to deliver for sustained impact including monitoring and increased accountability. 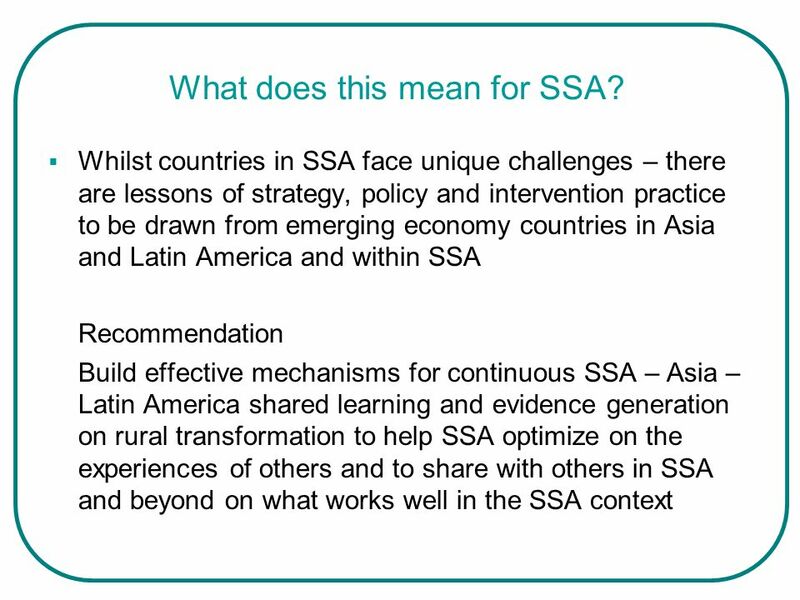 21 What does this mean for SSA? 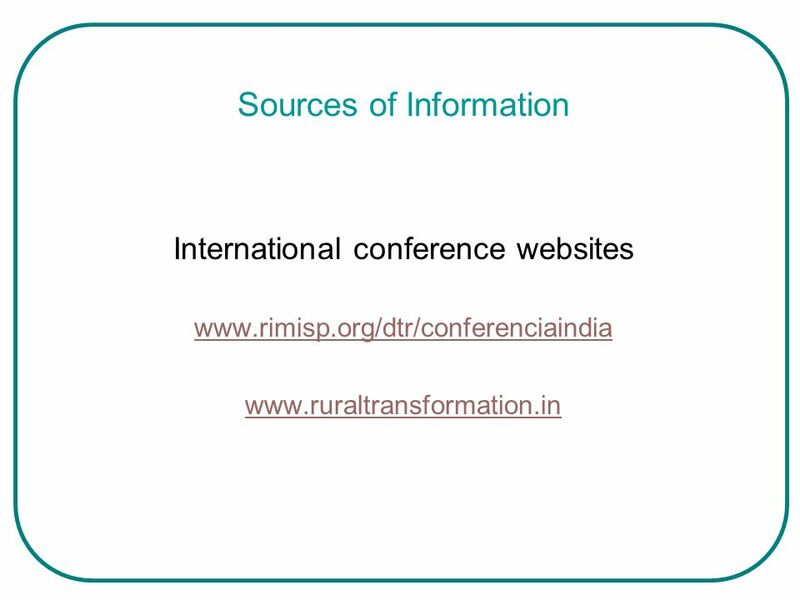 Download ppt "Rural transformation processes: can we learn from other experiences?" Sharing experiences between Asia and the Pacific and Western and Central Africa Achieving the Millennium Development Goal of Halving Poverty by 2015 Sharing. SDGs and the Global Sustainability Agenda Prof. Dr. Armida S. Alisjahbana Universitas Padjadjaran Indonesian National Academy of Sciences Sustainability.